The conflict in Yemen has caused immense suffering, exacerbating the longstanding water crisis in the country. For nearly a year, Yemen’s water infrastructure appears to have been under deliberate attack. This open source intelligence (OSINT) investigation looks into the latest attack (allegedly January 8, 2016) on a water facility, the seawater desalinisation plant north of Mocha, 2016, and places this attack in a wider context of attacks on illegitimate targets, specifically water infrastructure. Impression of territorial control in Yemen as of February 3, 2016. Yemen has been at war with itself for nearly a year, since Houthi (officially called Anṣār Allāh) rebels ousted the government from Sana’a. Since then, Saudi Arabian forces have come to the aid of this government, forming a coalition with the United Arab Emirates, Bahrain, Qatar, Kuwait, Jordan, Egypt, Morocco, Pakistan, and Sudan. The Saudis have stated they want to restore the Yemeni government, an ally of the United States (US) in the fight against al-Qaida in the Arabian Peninsula (AQAP). The Saudi-led coalition started bombing Yemen since March 2015 with a large number of airstrikes, of which the United Nations (UN) believes 119 might have been in contravention of international law. The Houthi rebels are also accused of war crimes. Both parties are active in Taʿizz province. Photos spread on Twitter, allegedly showing the aftermath of a Saudi-led coalition airstrike on the Mocha seawater desalination plant. Although the many reports on social media speaking seemingly referring to different dates, January 8, 2016, is the first time the attack on the desalination plant was mentioned in this this Facebook post. Two days later, a 79 second YouTube video, was uploaded by the pro-Houthi media outlet 21sept, a name that refers to the Houthi takeover in Yemen, known as the September 21 Revolution. The video’s description speaks of severe damage to the desalination plant and says the airstrike left several ‘martyrs’ dead, including one truck driver. To ascertain whether there is a water desalination plant near Mocha and whether the video indeed depicts the possible plant, a quick Google search are enough for confirmation: there is a website of the Yemen Company for Desalination (YCD; Arabic: الشركة اليمنية للتحلية), the private industrial company founded by HAS & Co. that owns and operate a desalination plant near Mocha. The following photo on the YCD website clearly shows that it is the same facility as in the video. Above: Photo from the YCD website. Below: Still from the 21sept video. Water desalination plants are usually coastal, so one could scan the west coast of Yemen north and south of Mocha, but the facility is already added as a location on Wikimapia. Overview image of the location of the Mocha desalination plant. Corroborating and mapping the key features of the stills of the YouTube video confirms another time that the video does indeed show the water desalination plant near Mocha. Overview of the Mocha desalination plant with still from the 21sept video. Was the water desalination plant functioning when it was destroyed? It is hard to tell whether or not the desalination plant was producing water at the time it was destroyed. If the plant was deliberately targeted, that suggests it was being used for something. The Yemen Post writes that one person was killed and four were wounded in the attack, but it does not say if they were working at the plant. The description of the sept21.com video speaks of several ‘martyrs’. In the video, tanks 02 and 04 can be seen leaking. Tank 02 has water coming from a perforation high up, suggesting it was nearly full when it was damaged. Tank 04 has some small leaks as well as two large ruptures, which may have been caused by the weight of water pushing out of the damaged tank. Furthermore, the ground is wet, possibly from water stored in the tanks. Still from the video shows that liquid pours out of tank 02 and tank 04. None of this proves the plant was functioning on January 8, 2016. However it does suggest at least two of the seven main tanks were full. The YCD website, the satellite imagery and the post-attack photos show these tanks were used to contain desalinated water destined for the tanker trucks. The images and footage also suggest at least tanks 02 and 04 were nearly completely full of liquid just before the attack. Using two website dating sites, Timetravel and Carbon Dating the Web, the last edit to the YCD website was made January 11, 2016, three days after the attack. However, we have not been able to find this last edit on either the Arabic or the English versions. Regardless, it shows someone with the ability to edit the website changed something just after the attack. Whatever the user changed or added, it shows there were people involved in the YCD site paying attention to their plant, either because it was running up until the attack, or that it had relatively recently stopped producing water (as suggested by the presence of liquid in the tanks). There is a ‘recent news’ section on the YCD website. It has news from between January and March, but does not specify which year. It is most likely of 2015, because the Yemen Times ran a story in December 2014 when the plant was still just a plan. Who is to blame for the destruction of the water desalination plant north of Mocha? Most Twitter users are blaming the Saudi-led coalition. Also used is the hashtag ‘#USAkillsyemenipeople’. The US, as well as the United Kingdom (UK), are selling weapons to the KSA and are providing advisors to help increase targeting precision. The KSA definitely has the capacity to destroy the plant. It has been dropping ordnance on Yemen since March 2015. Does the KSA have a motive for attacking the plant? If the plant was still supplying the contested held city of Taʿizz and parts of Houthi-held territory, then perhaps its destruction would force the Houthis to move. Alternately, the plant could have been used as a firing position by Houthis, making it a military target, as the KSA has claimed before when it targeted an alleged water facility in Yemen (see the bullet points listed below on earlier attacks on water infrastructure). However there is no hard evidence that Saudi jets or any other member of the Saudi-led coalition responsible for the attacks. Although there is evidence that the damage was caused by an explosive (damage to tanks 02 and 04, various debris scattered about visible in the video), this does not attribute blame. The Taʿizz coast is quite barren. There is Mocha, a few ports, and this desalination facility, which is quite easily identifiable – as demonstrated in this article. If the plant was being used as a position from which to fire on Saudi or Yemeni government forces that would make it a legitimate target. Otherwise, under Protocol I of the Geneva Convention, to which Saudi Arabia has been a signatory since 1987, the plant is an illegitimate target. An alternate perpetrator might be among the wide variety of groups currently fighting the Houthis for control Salafist of Taʿizz city. For example, a video released in early January 2016 claims to show Al-Qaeda in the Arabian Peninsula (AQAP) fighters in Taʿizz engaging with Houthi forces. The footage shows AQAP have truck-mounted recoilless rifles which could possibly have caused the damage to the plant. Other groups, such as the pro-Hadi Security Forces, Islah fighters (Yemeni Congregation for Reform), or Popular Resistance Committees, are also actively fighting the Houthis in Taʿizz. These groups could have aimed to destroy the plant for similar reasons hypothesised above: to weaken the Houthi position by thirst. On the other hand, it seems that the desalinisation plant also provided water for pro-Hadi controlled areas. April 17, 2015: An alleged Saudi-led coalition airstrike water tank in al-Hazamat, Sa’ada City, reported by the United Nations Office for the Coordination of Humanitarian Affairs (OCHA). 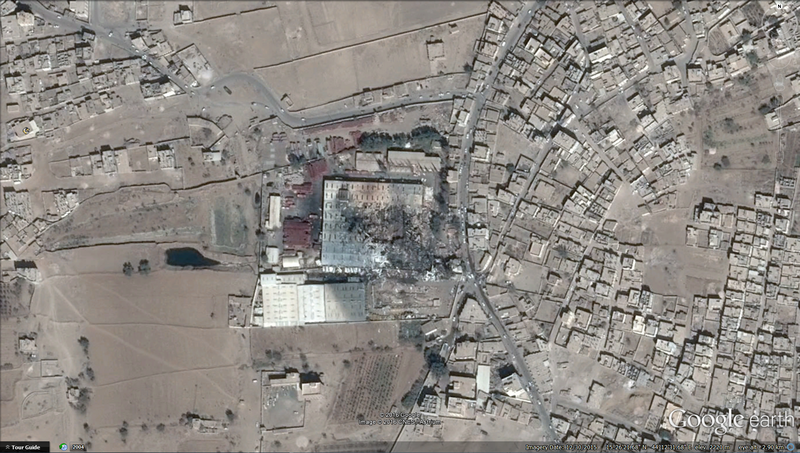 April 18, 2015: An alleged airstrike on an Oxfam-run warehouse with water equipment in Sa’ada City. The warehouse stored equipment for a water project funded by the European Union. No location (yet). April 22, 2015: The water tank and the pipes at the al-Jumhouria hospital were damaged during fighting, according to OCHA. They were repaired days after. Location: 12°48′21.3″N 45°02′17.2″E. April 26/27, 2015: Airstrikes reportedly hit warehouses belonging to the Shamlan mineral water company, according to OCHA in Taʿizz City. No location (yet). 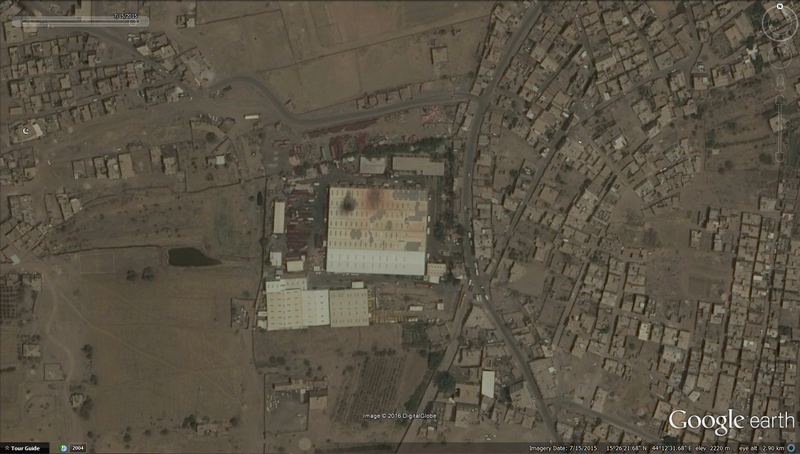 August 30, 2015: An alleged Saudi-led coalition airstrike water tank on Al-Sham bottling plant in Hajjah. According to the Houthi-run Defence Ministry, the airstrike left 34 people dead. The airstrike struck the isolated building at the end of the night shift, the New York Times reported. Euronews has a video online of the aftermath of the alleged airstrike (0:00-0:11). A spokesman for the Saudi-led coalition told CNN that was a military camp used to make explosives and ‘to train African migrants forced to take up arms.’ No location (yet). December 29, 2015: An alleged Saudi-led airstrike on a Coca Cola factory in Sana’a, which burned to the ground after a massive explosion, according to the Wall Street Journal. Coca Cola Co. confirmed the facility had been hit but said there were no reports of casualties, as the facility was closed for maintenance. Location (verified help of photos and video): 15°26′21.8″N 44°12′31″E (The damage done to the facility can be easily recognised on Google satellite imagery, that has footage of the day itself). While some reports mention December 30 as the date of the attack, some tweets mentioning an airstrike on the Coca Cola factory were already posted on 29 December around 9 PM local time. Human Rights Watch also reported the alleged strike as being from the 29th. The images circulating online show the aftermath of an attack on the YCD desalination plant north of Mocha. This OSINT investigation has shown that this attack likely took place on January 8, 2016. The plant was probably still functioning when it was attacked, or at the very least had liquid in it – most probably water the citizens of Taʿizz and Mocha could have used. Water plays a vital role in war-torn Yemen. A staggering 13 million citizens struggles daily to find or buy enough clean water to drink or grow food. That is around half of Yemen’s population. If the shortages are not decreased any time soon, there is a chance of large-scale epidemics, according to the World Health Organisation’s head of mission in Yemen. A report in the pro-government newspaper Al-Thawra estimated that around 70-80% of conflicts in Yemen’s rural areas are about water. Yemen has a severe water deficit which continues to grow annually. There are many factors contributing to this imbalance, including natural water scarcity, increasing demand, poor governance, a dry climate, climate change, low efficiency, inadequate investment, poor use of land (khat) – and so forth. Bombs should be of least concern. * Brendan Clifford is a graduate student at King’s College London reading International Relations. He has a degree in History from the University of Cambridge. He can be contacted by e-mail: brendanjamesclifford@gmail.com. ** Christiaan Triebert is a graduate student at King’s College London reading Conflict, Security and Development. He two degrees from the University of Groningen in International Relations, and in Philosophy. He can be contacted by e-mail or Twitter: christiaan.triebert@gmail.com, @tbrtc. Update 2 February 2019: An earlier version of this article said that the alleged air strike on the Coca Cola factory in Sanaa took place on 30 December 2015, as was reported by several media outlets. Closer inspection by Haley Willis revealed that the strike was already reported on social media around 9 PM local time on 29 December 2015, after which the article was updated. The absence of impact craters on the side of the leak and the size of the leak holes suggest that particular damage was most likely caused by heavy machine guns or light anti-aircraft guns. It doesn’t seem as though anyone involved in this report was competent to assess damage. agree with the conclusion: whoever conducted the attack committed a war crime! Unless he can prove it was used as a military facility, but then anyway we may argue about the principle of proportionality: was the benefit occurred from the damage to this plant so relevant compared to the suffering inflicted? It’s normal to position anti-aircraft guns so that they’ll fire away from civilians. Moreover, the coalition is flying above their effective range. I know that Mr. Obama gave Yemen a lot of military aid, and that included radar capable of detecting altitude of planes. Some from the positioning and the futility of the AA guns I have to conclude the Houthi wanted to cause civilian casualties. I believe a fair investigation is necessary and that anyone deliberately causing civilian casualties or failing to take precautions dictated by international law should be prosecutes. However, I take issue with the press blaming everything on the coalition. It is unethical for them to blame anyone without first having an expert evaluation of the photographs and any other evidence. Thanks so much for your input, it’s really interesting. We tried to be as cautious as possible in our analysis without producing a totally empty article, but we appreciate what you’re saying. Could you send me an email with any more information or ideas and I’ll look at incorporating them into the article? I would suggest the question is: “Who did this?” As far as the desalination plant, which I referred to earlier. It looks like it was attacked from the ground. The top hole on the left is gushing water perpendicular to the row of tanks. degrees from the tank. The tank behind it, in the second row does not show odamage, as it would it it had been hit with a or rocket. There is no impact hole in front of the tank. The smallest modern bomb (250 lbs) leaves a crater 6-7 foot deep and 15-18 foot in diameter. The holes are not multiple as they would be if hit by a machine gun or rapid fire weapon on might see on an attack helicopter. In addition, the holes in the tank on the right are nearly at a 45 degree angle form the hole on the top left. The holes most strongly suggest shells entered from different directions. I would guess that a truck mounted single fire antiaircraft weapon drove around the tanks, shooting it up. These are typically 20 or 40 mm, single fire explosive shells, typically fired by depressing a foot operated lever. The tears appear to be too high to have been caused by water pressure. The damage is consistent with a shoulder fired RPG. The truck could have been set ablaze by either weapon. To me it is obvious that the damage resulted from small arms fire. An is only consistent with a local attack. It was probably done by the Houthi, possibly during a coalition air raid in order to implicate the coalition in humanitarian crimes. The second building was hit by a much larger explosive. It could have been a coalition bomb or it could have been a Houthi Tochka missile. An on site team would be needed to investigate this. Fortunately, there are some pretty good damage assessment teams out there. Also, traces of the explosive and any rocket fuel are like fingerprints. You can use them to identify the exact munition and even the direction of an incoming rocket. Moreover, traces can stay around for months, or even years. Doesn’t look like an airstrike. Reasonable assessment Richard, nice analysis. I have been working in the South of Yemen doing water project with the French organisation DIA in the past. I know very well the infrastructure and i am sure the result will really hurt the people of Taiz as i know they were only depending on few boreholes around the city. It is really bad to see the destruction of the desalanisation plant. Be God be with the people of Yemen in those difficult times. Too bad the comments are so lopsifedly pro Saudi and pro censor the Saidi led massacre of Yemenese.